In our first installment of our Indoor Allergy Season series, we discussed some symptoms of and solutions for mold and fungus. Now we’re going to delve into allergens caused by your furry friends and some not-so-cuddly crawlies. Below are some symptoms that may indicate you have one of these allergies. If you experience one or more of these, a potential allergy is worth investigating. Get the FactsYes, you read that right. 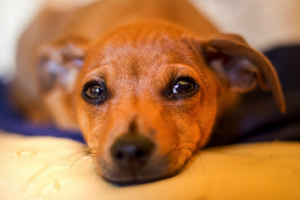 Almost 1 in every 6 people are allergic to our lovable companions. But this doesn’t mean you have to abandon all hopes of living with man’s best friend (or a significant other extremely attached to theirs). Simply learning about these allergens and seeking the right solutions can make your indoor allergy season a much more bearable one. First and foremost, you should get an allergy test. 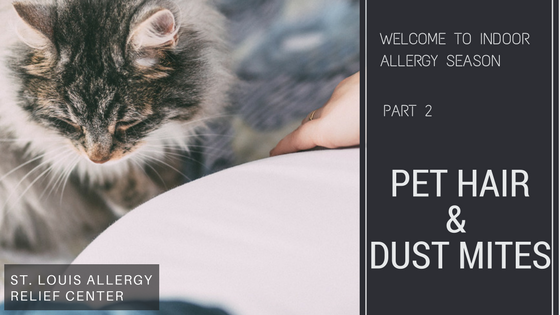 What you thought was your body’s negative response to Fido or some unswept dust could actually be another allergy or a different affliction altogether. If it does turn out you’re allergic to pet hair, know the facts so you can best resist a reaction. Allergens are proteins that can stick to an animal’s dry skin or hair. When these fall off your pet, they accumulate on walls, furniture, and floors, where you then inhale them and experience an allergic reaction. The reaction is caused by your body’s production of antibodies that try to combat the inhaled particulates. Myth: Hairless cats or dogs will prevent an allergic reaction. Truth: This is not true; even hairless pets can still cause an allergic reaction. Allergens can accumulate to their discarded dander and other wastes. Being allergic to pet hair isn’t the end of the world, and you can still live with a furry companion if you want to. Some potential solutions are to minimize the pet’s contact with places you spend time most. Mark off zones you spend the most time in, where the pet is not allowed to go, so you can have complete relief in these areas. Installing High-Efficiency Particulate Air (HEPA) filters can also offer a reprieve, as they will get rid of most if not all of the hair and dander left behind. Keeping your pet clean will help as well, so as much as they might not like it, make regular baths a priority. Animals besides pets may be causing your allergic reactions, but they might be too small for you to see. 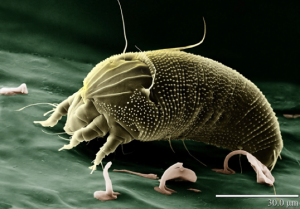 Dust mites are tiny relatives of spiders that feed on dust and human dander, often finding homes in residential houses. When you breathe in the waste products of dust mites, your body produces antibodies to combat the invasion, causing your allergic reactions. The idea of barely microscopic insects waste causing your allergic reactions may be revolting, but that doesn’t mean you have to live a life in agony. Might You Try One of These Solution? Much like reactions to pet hair, since the cause of dust mite allergies is well studied, quite a few solutions are available. A great first step to no longer being bugged by dust mites is getting allergy resistant bed covers, pillowcases, and bedding. These will prevent the accumulation of dust, dust mites and allergens, providing you an uninterrupted night of sleep as well as daytime relief. High temperatures kill dust mites, so be sure to wash and dry all clothes at highest heat. If your washer and dryer do not go high enough or you want extra protection, consider an anti-allergen laundry additive. It should go without saying, but vacuum and dust frequently. Dust=dust mites! Avoid upholstered furniture that can easily accumulate dust or house dust mites. A HEPA filter can fight dust and dust mite particulate as well as pet hair. Investing in one of these is a must for any allergic individual. 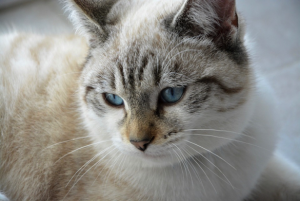 Don’t let pet hair and dust mites bog you down anymore! Incorporate these tips into your household, then make an appointment with Dr. Ian Wahl at St. Louis Allergy Relief Centers. Our goal is to help relieve you of your allergies symptoms so that you can go on living life to the fullest.